Completed 1967 as Naticina for STUK. 1972 fitted with fenders and began lightening work around UK. 1986 returned to trading. 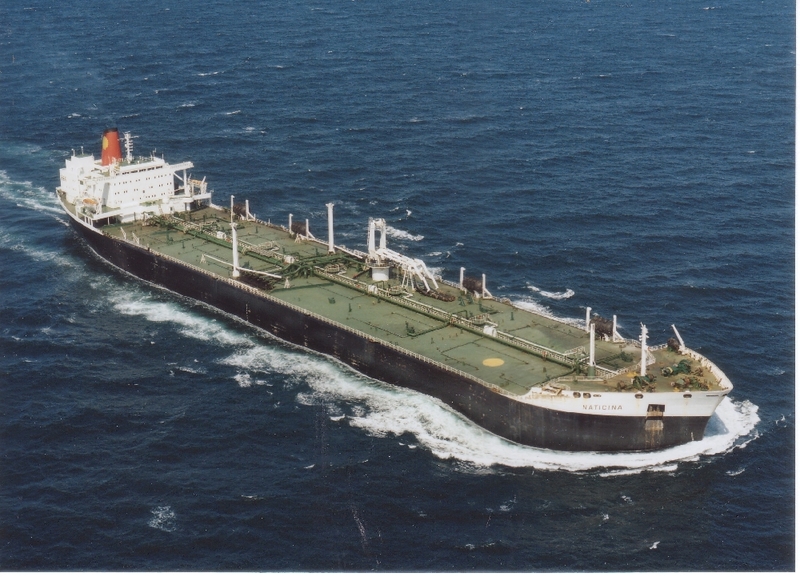 1990 as Naticina to Shell Tankers Rotterdam. 17-9-1993 arrived Chittagong for scrap. Joined her in late 78. She was said to be the "busiest" tanker in the world as she continually loaded in Lyme Bay for discharges in NW Europe. Not sure if that accurate - but she was certainly busy! But she was also manned by professionals who knew the job backwards. During my time on board we lightened both the Shell 500kdwt "B" Class (They were huge even from a 100kdwt ship!) - and in perhaps the one mistake made during my time on board - we "held on" a little to long in bad weather, and found ourselves attached to another ship only by the hoses of the "praying mantis" as all our moorings failed! This left a number of our crew on the other ship who later rejoined some days later - still in their boiler suits! It was shortly after this I believe the "praying mantis" fell off and became a marked wreck in Lyme Bay if I recall?? My daughter was conceived on the 'Natty', I had her mother stowed away for a week or so. Went from Tranmere to Angelsey, lightened, then back to Tranmere. Always had a ball on this ship. I sailed on her 4 times between 75 and 86. Gulf War; Trading Arabian Gulf to Port Dickson, Malaysia. I well remember the Naticina or the "chatty Natty" as she was better known. I sailed on her a few times in the privileged position of Captain's son, very sought after but sadly unpaid. I remember lightening the battilus: a truly huge tanker that dwarfed the Naticina and I remember looking from her bridge to the deck of the Battilus and then half way down her side after she was lightened and the Naticina was fully laden. It was great fun as an 8/9/10 year old to be on such great ships and I think I made myself a pain in the *** to some of the unfortunate captives on board. yet another great ship to be on in the late 70s to early 80s really busy for a big ship around the uk/europe coastal trade plus a fair bit of lightening thrown in. one incident really sticks in my mind is the day the natty was nearly sent to davys locker while carrying 100,000 tonnes of crude from a lighten job in lyme bay ,i think we were travelling around past the entrance lanes for the thames,when out of the blue a cargo ship nearly t boned us , i will never forget the ships name CAPTAIN JOHN ,we were 2/3 feet away from a collision ,could of shook hands with crew members watching and praying from the greek vessel.dont know if anything came of the incident as they were reported. this event was far outweighed by the great times i had while working on this ship,did 4/5 trips on the natty. Ijoined this ship in elsinore brand new, and the main thing i remember about her is that she had the best crew bar of any ship i,ve ever been on. Have you sailed on Naticina (2)? Log in and add yourself as a sailor to the Naticina (2)! Log in and add your personal story to the Naticina (2)!